I have been asked several times in recent weeks about my thoughts on professional development for teachers, especially regarding preparing to work in what are being called 21st century learning environments. People have even written to me through this blog saying that really want their teaching to move forward but ‘don’t know how”. Before I start I must emphasis that some schools and authorities are doing this absolutley brilliantly and really working with thier staff as a change team - it's just fantastic when this happens. It is not consistent across the country though I fear. New learning environments typically feature fewer enclosed or ‘traditional’ classrooms, rather a variety of agile spaces where a variety of learning and teaching can take place. Areas include; breakout areas, large spaces for lead lessons, seminar areas, group work, research and individual work spaces, presentation and performance spaces and so on, all supported by pervasive computer technology firmly embedded within them. What absolutely CANNOT happen regarding professional development for these spaces is to wait until they are built. The professional development of teachers AND students should be ongoing and certainly have started as the plans for the new schools begin to be designed. Teachers and students must know the ways they wish they could work now (and think about the future), contribute to the design debate and still allow buildings to cater for future learning styles that are currently unknown. Professional development for new learning spaces and styles is not best undertaken by a series of ‘one off’ professional days listening to some perceived expert - although these do have their uses if the focus is right. Nor are mandatory after school CPD sessions particularly effective after what can be a gruelling day. Most effective is working with teachers, in their room, with their students. 'Learning Leaders' (call them what you will) supporting teachers using and develop new learning and teaching styles can be really effective, working on ‘real’ work during a normal day. Usually most effective is to arrange this support working with every member of a faculty or department simultaneously. This allows real time modelling of good (and new) practice, team teaching, real time support, group work, mixed groupings, lead lessons, small group work with the whole team working, learning and gaining confidence together. This is not a one hour session – this takes some days to really embed in along with return visits. Real time evaluation and changes in approach can also be developed along with codes for students of expected behaviours and work habits. ‘Doing it to just one individual’ just is not anywhere near as effective and can be pointless. But just like teachers, students cannot just walk into a new environment and be expected to do things differently without any preparation. 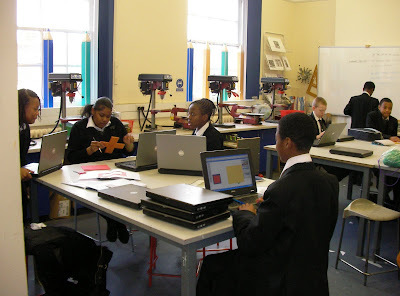 Lots of amazing and innovative learning takes place despite occurring in the most traditional of spaces. New environments do make a difference and allow even more flexibility and opportunity which many really benefit from. Some schools and authorities are developing test beds within schools or in areas for teachers and students to be able to develop new learning skills. This is really good practice. Obviously these are best employed in schools so it does not become a ‘special day out’ for everyone , immediately losing some relevance. The rules for using these spaces is that who ever is in there ‘must do it differently’! If these exist there has to be a real programme of all staff using them, so they do not just become a ‘white elephant’. I know someone will write in about challenging behaviour preventing all these things happening, but by combining groups (and hence more staff) and having students working in a variety of ways, those that can work will, without wasting time waiting for the others, the ‘audience factor’ reduces and greater focus can be put on those needing it. Of course every school has its challenges and some are particularly tough – I totally accept that. All I am suggesting is that the approach to professional development needs to be really thought out much more carefully in some of the places I have visited here and abroad. It comes down to inadequate professional development budgets and insufficient priority. CPD budgets are also often the first things cut in any saving programme. This is bonkers – the whole value of new buildings programmes can be severely compromised if people aren’t really confident of developing the learning opportunities that the spaces allow. How can NOT planning the really effective development of staff and students before they enter new environments be sensible? Gareth, this is an interesting post - I wish that you could have been the advisor to the authority I work in, who are now running around like headless chickens because they have left it too late. Keep writing, it is often very interesting. Thanks for the comment. I must stress there are many places really trying to get their CPD right and doing a really good job. If you are a freelance consultant and there are other freelance consultants out there who have been advising these authotities going with 21st C learning, then surely someone should have realised all this a little bit earlier?! I am amazed that you can write what you have just written with an attitude of 'I wonder why they aren't training teachers'. I am absolutely horrified and gobsmacked at this piece of writing. But, deep down when I really think about it, I am not really surprised. I am just one of those educational facilitator people who will be left to pick up the pieces. Yes, I am a teacher. God help me! Please don't reply with some condescending rubbish. Please. Thanks for the post - it is not unusual that there are differing views or comments. Many teachers have been requesting proper professional development for years to help prepare for new environments and the use of immersive technology. As I said in the post many authorities and schools have been doing a totally fab job in being smart and preparing for ever changing learning and teaching methods in new environments. The point is not all - that's what I can't understand. I have every respect for teachers and continue to do so. I was one for decades and am married to one. Sorry you did not like that particular post but keep reading - they are not all like that. To the person who commented ‘representing ‘the lions’ – or teachers. I do not know if those who comment positively are friends or not – they tend to post as anonymous – as you did. I may even know you, but probably not I suspect. Certainly there are days when many ‘hits’ come from countries around the world where I do not know people. This blog, amazingly, gets hundreds of hits a week, not just from the UK but from all over the world. There is a 40% return rate of visitors to the blog, so some people seem to like it. As the top of my blog notes, it started in 2007 as a method of recording experiences, tracking what I am doing, noting a few thoughts when I can (much of my work ‘belongs to the client’) and when possible, highlighting good practice or nightmares when I come across them. I am very very fortunate to meet and work with some amazing people from all over the place. None of it is meant as ‘name dropping’ or ‘posing’ or... – it’s just what I have been doing at that particular time. Thank you for your post but I am not publishing it as written. I suspect that it is not the most constructive of comments to call all education consultants ‘donkeys’. This is the end of this thread of comments folks.